Our house, for example, has been Gracie-proofed, to the extent necessary for now. Always a work in progress. A few months ago she turned her bed into a trampoline, jumping up and down until she broke the wood frame in the box spring. So, my father and I, being handy and all, repaired the frame and reinforced it. Wasn’t too long after that before she broke the frame again, and one of the bedframe wheels. The wheel post then ground its way through the brand-new Pergo floor my dad and I installed earlier this year, while Gracie continued to bounce merrily away. Yeah, I was a little aggravated, but I worried about her flying through her bedroom window during her trampoline sessions. Was considering closing the accordian style storm shutters over her window. Oh, but the challenges didn’t end there. Sometimes Gracie would lay on her back with her legs and feet up on the walls, kicking away. I was just waiting for her to put her feet through the drywall. One night Gracie drummed the walls so hard that photos, etc., started falling off the wall’s other side in the adjacent family room, while Kristine and I were watching TV. And if the bed was positioned up against the window, Gracie set to work on trying to destroy the horizontal blinds, or would go underneath the blinds and stand in the window on a 4-inch window sill. Unless you saw her feet sticking out underneath the blinds, you wouldn’t have known she was standing in the window. I imagine passers-by knew, though. That must have been a strange sight for them, seeing a pajama-clad girl standing in a window with nothing for a background but the blinds. Sort of like looking at a mannequin while window shopping. Hmmmm…. how to fix these issues? Gave this a lot of thought during the times I drift off (I do this a lot). Not sleeping, but thinking and not really present. Remember the memory foam mattress commercials with the lady jumping up and down, and a half-full wine glass on the other end? Not really a lot of bounce on those beds. Add a headboard and position the new memory foam bed in the middle of the room with the headboard against the window, problems solved. 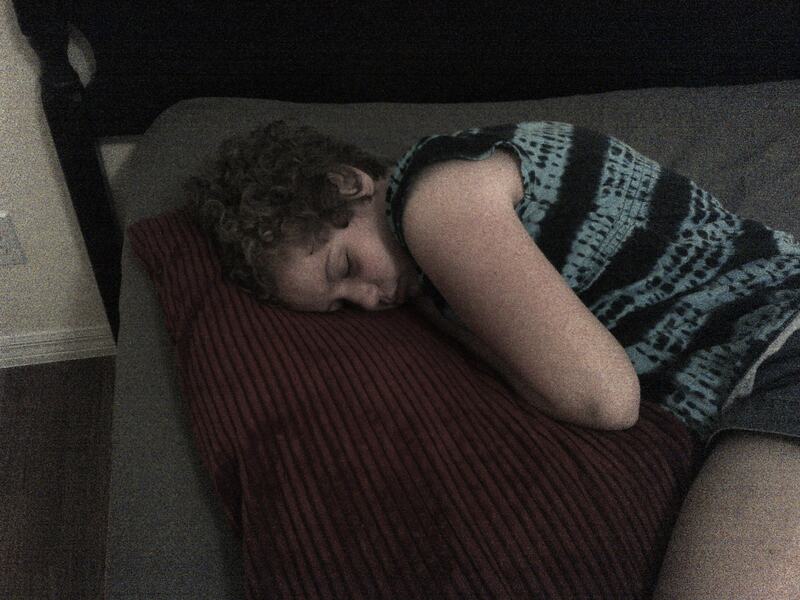 This entry was posted in Issues and tagged autism, sleeping challenges with autistic children. Bookmark the permalink. So I always wondered if those memory beds are comfortable? I keep meaning to take a nap on it to find out for myself, but never get a chance to do it. I rarely take a nap anyway, like once a year. Kristine claims it is, and Gracie seems to sleep better now. Thanks, Ayron, I’m glad you think so. It certainly isn’t easy, but we try our best. Does it seem to upset her that she can no longer jump on the bed? I am afraid My son would have a melt down if he can’t jump on it anymore.